Here's our quick guide to seasonal wedding flowers. This could save you a lot of frustration, if you set your heart on one type of flower only to find it is out of season when you are getting married. 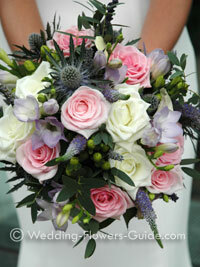 Sometimes brides getting married in the winter worry there will not be any nice flowers available. Far from it! There are many winter wedding flowers available; some that come into season at this time include: amaryllis which make a striking table centrepiece and holly which can be incorporated into a Christmas wedding flower decorations. Although cymbidium orchids are available year round, we tend to find that the best choice and prices are to be had now. Other tropical flowers are also available now. 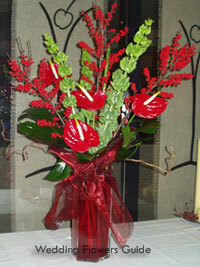 You can see in the photo that I have used red tropical anthuriums together with branches of ilex berries (holly). The vibrant colors of these have been offset with green Molucella (commonly called 'Bells of Ireland'). Another idea for winter weddings is to make a spectacular background to your flowers by using vibrant red dogwood stems and tactile pussywillow stems that are available now. Spring is the time when nature bursts into life, and treats us to a spectacular array of colours. Flowering bulbs come into season now such as tulips and the wonderfully fragrant hyacinths. Peonies also put in their seasonal appearance. This flower is available to florists from wholesalers during winter but it's real season is Spring. 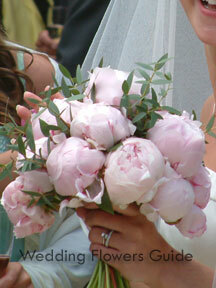 The photo shows a peony bouquet that I did for a lovely bride who wanted the flowers in bud. If you prefer the flowers to be more open, just let your florist know. Forsythia bears its yellow flowers in Spring, and is unusual in that the flowers appear on the plant before the leaves. Another popular spring wedding flower is Lily of the Valley. This delicate and wonderfully perfumed flower has a very short season around April/May. Lily of the Valley is one of the more expensive seasonal wedding flowers. In summer you have a large choice of flowers available. The flowers in season at the moment include beautiful blue delphiniums, gladioli, and columbine (aquilegia). Irises have their season from late spring through to summer. There's something about roses that always says summer to me. I'm not sure what it is, maybe because I always remember seeing roses in parents garden when I was growing up. Although they are available from florists all year round (they are cultivated indoors under glass), roses can really give a 'summer feel' to a bouquet. If you want a summer theme to your flowers, use roses in mixed bouquets with bright colors. You can see an example of this in the bouquet above where I have used pink roses together with lime green chrysanthemums. Snapdragons (Antirrhinums) are available now. For many people like me, they evoke happy memories of childhood summers playing with the flowers and making their 'mouths' open and close. Other summer seasonal wedding flowers include cockscomb and Love-in-a-mist (Nigella). When people think of Fall wedding flowers, it is often the colors as much as the actual flowers that are important. Rich reds, fiery oranges and beautiful yellows are the order of the day. You can see these colors in the bouquet in the photo to the right. 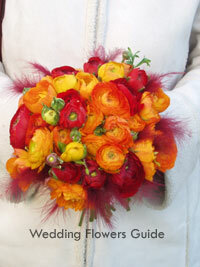 This bouquet was made in Autumn and is created from ranunculus, which had just started appearing at our wholesalers. In autumn, some interesting fruits become available that can be used in wedding arrangements. Crab apples last from now through to the winter and can look very attractive. The unmistakable Chinese lantern fruits (Physalis), make a very appealing flower for a centrepiece arrangement. 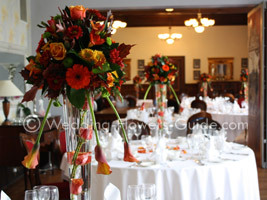 Other autumn seasonal wedding flowers that are in season now include dahlias and ornamental cabbage. If you're planning a fall wedding, you're in good company. We've noted a marked increase in the number of people opting to have their wedding in September and October. The good news is that many flowers have a longer or even year-round season these days. This is due to imports from warmer climates, and commercial growers cultivating the flowers under glass, out of season. For example, the photo shows a simple white tulip centerpiece taken as we were setting up a wedding venue. Tulips are a classic spring flower. But look more closely at the photo and you will probably notice the lazy rays of a winter morning sun coming through the window - this wedding was in mid-winter. Commercial growing techniques now mean that flowers like tulips are available out of season. However, expect the best quality and lowest prices to be for seasonal wedding flowers that are in their normal flowering season.